Beijing wants to shore up growth without inundating the economy with cheap credit. Chinese leaders know that their country suffers from massive over-investment in construction and manufacturing, that its real-estate market is a bubble that makes the Dutch tulip frenzy look restrained, that both conventional debt and debt in the shadow-banking system are too large and growing too rapidly. But even as the Communist Party centralizes power and clamps down on dissent, it dithers when it comes to the costly and difficult work of shifting China’s economic development onto a sustainable track. Chinese authorities have tried to tackle some of these problems, but often retreat when reforms start to bite and powerful interests push back. To see how hard that will be, The Wall Street Journal's Nathaniel Taplin takes a look at China’s roads and railways. 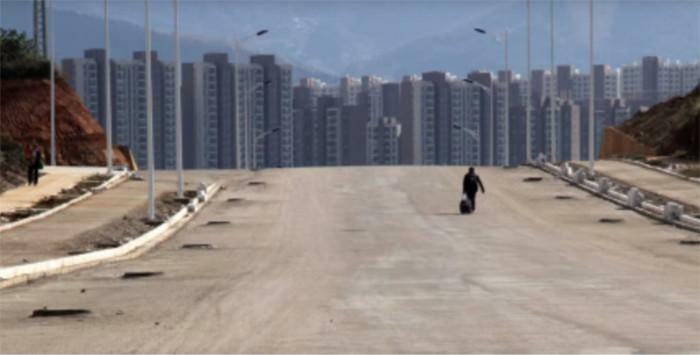 China is the 800-pound gorilla of global infrastructure. Its building prowess has permeated popular culture, as in the disaster movie “2012” where China constructs giant ships to help humankind escape rising seas. Recently, however, China’s infrastructure build has all but ground to a halt. The central government last year started to crack down on unregulated, opaque - so-called 'shadow-bank' borrowing - alarmed at its vast scale, and potential for corruption. 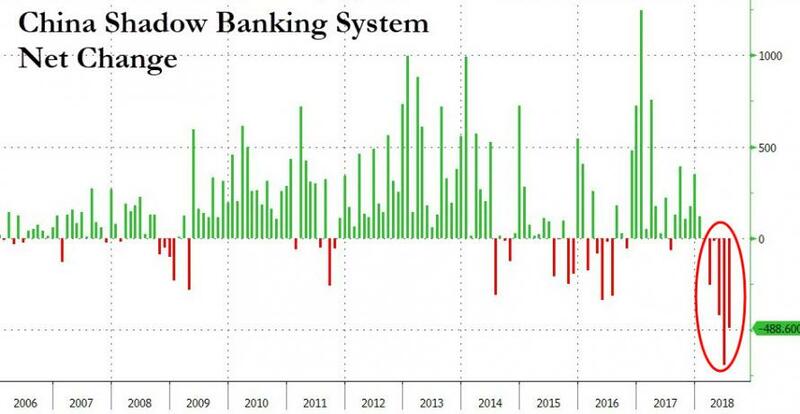 For five straight months, the shadow banking system has contracted under this pressure, sucking the malinvestment lifeblood out of economic growth and construction booms as Chinese local governments, which account for the bulk of such investment, set up as so-called local-government financing vehicles (off balance sheet), or LGFVs, and have seen an unprecedented net $19 billion outflow in recent months. 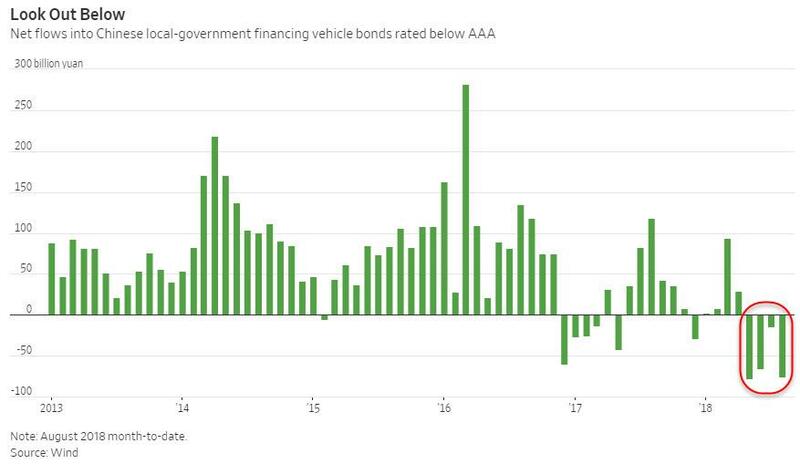 As WSJ's Talpin notes, these days Beijing prefers that local governments borrow on-the-books, through the now legal municipal bond market. The problem is that lower-rated and smaller cities are mostly shut out, even though they do most actual capital spending. As a result, investment has kept slowing even though China’s net muni bond issuance in July was three times higher than it was in March. Infrastructure investment excluding power and heat was up just 5.7% in the first seven months of 2018 compared with a year earlier, down from 19% growth in 2017. Eventually, all the cash big cities and provinces are raising through muni bonds will start filtering down. 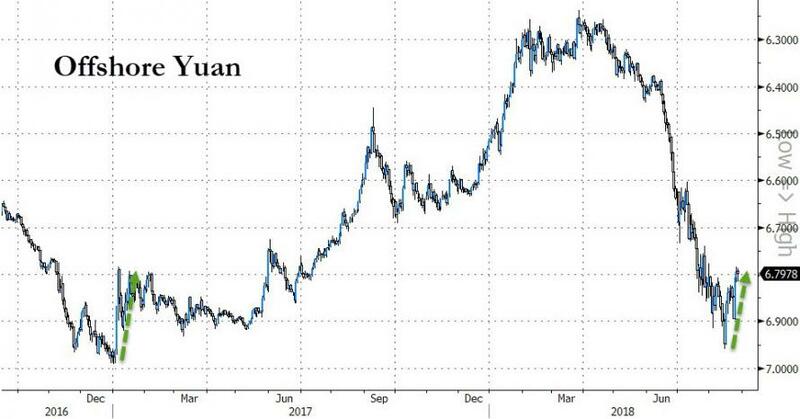 Meanwhile, the investment drought will likely worsen, raising pressure on Beijing to ease credit conditions further - making the incipient rally in the yuan hard to sustain. That also means China’s debt-to-GDP ratio, which fell marginally in 2017, could start rising again next year. 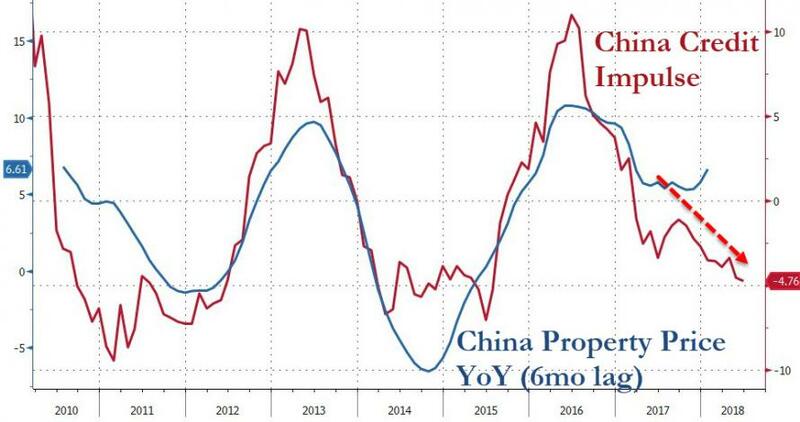 Simply put, as with water and wine, China’s leaders haven’t figured out how to crack down on local governments’ dubious infrastructure spending during good times without severely damaging growth - or how to loosen the reins during bad times without creating lots more bad debt. Unless they can square that circle, it bodes ill for the nation’s long-term prospects.